Fans are the very first enemy that you will even encounter. They travel in packs ranging from five to nine, and follow each other in a trail. They appear high or low on the screen, move up or down to another row closer to you, and retreat away from you at the same horizontal plane as your ship. They will leave a power-up capsule behind if you destroy the entire formation, so try not to allow any to escape. These spinning attack ships tend to fly in groups of two at a time, weaving through space on a sine wave trajectory. They never deviate from this trajectory, and they are rather fast. Try to destroy them early on when they are far away, and avoid them once they get too close to your position. They are easiest to hit at the top and bottom of their wave path. Garuns also come in a power-up capsule dropping red color. Ruguls are a form of attack ship. They appear on the right side of the screen and they don't move very quickly. They will, however, home in on your position, flying up or down, or even turning all the way around to chase after your ship's position in space. They are easy to destroy since they commonly ending up lining up with your line of fire. They also come in a red variety that leaves power-up capsules behind when destroyed. The second variation of Ruguls are much faster and much more dangerous than their original design. Their speed allows them to catch the Vic Viper, even after several Speed Ups, due to the limited screen space. But like regular Ruguls, they share the same weakness that tends to put them directly in front of your weapon range. Take them out quickly before they have a chance to gang up on you. Beans are another formation enemy. They appear in two different squadrons that criss-cross each other, almost creating the illusion of a figure eight. They travel quickly across the screen, but they don't fan out too high or low, so they are easy targets as long as you have a couple of Options to assist you. Like the Fans, they will leave behind a power-up capsule if you destroy every Bean in the formation. The Fose is another formation type enemy. These twirling enemies arrive in a slow snake like formation. They seek you out, and like Ruguls, will end up in front of your line of fire, but they move considerably slower, so there's a good chance they could end up just above or underneath your ship if you let them advance too far. Destroy the entire formation to receive a power-up capsule. Uskas appear like a formation enemy, but they actually aren't. They show up in long lines together, initially moving slow, and speeding up once they are halfway across the screen. As usual, it is best to blast them while they are still on the right side of the screen before they have a chance to begin speeding up. After that, steer clear of them or let your Options deal with destroying them instead. Zubs don't appear in the phase between stages like many of the enemies described above do. They first appear in a swarm as the sub-boss of Stage 2. From there, they don't appear again until you reach the fortress in Stage 7. They seem to appear out of thin air, and in many ways they do. But once they are fully materialized, they are just as deadly as any other enemy. They immediately begin to advance in a straight line from where they appear to wherever you happen to be at that moment. Steer clear of them and get behind them to get a good shot at them. The Uros are mobile cannons that hover along the surface of the top or bottom terrain. Occasionally, the pod at the top of the Uros will open and fire a bullet at you. You can fly to their level to destroy them, or rely on missiles or double-shot to take them out. Red Uros will provide you with power-up Capsules when destroyed. Dee-01 is the model name for an immobile tank that the invading army has set in several key locations. Although they can't move, they can pivot the turret in order to aim at you and fire at any angle. While they are easy to destroy, particularly with missiles, they are often positioned as barriers to the large hatches which release enemies. Red Dee-01s are rare, but they can be found throughout the second and third stages. A Ducker is a special kind of mobile cannon that walks along the terrain, top or bottom, on two stilt-like mechanical legs. They appear from the left side of the screen, race along the terrain in order to get ahead of you, and fire back at you. If left alive on the screen long enough, they get one or two more shots off on you. Although their shots are dangerous, they are more of a threat due to their unpredictable presence and motion along the top or bottom of the screen. Red Duckers appear from time to time. Jumpers are a lot like Uros, except they are far more mobile, due to their ability to hop along the terrain. Jumpers will only appear on the bottom part of the terrain, not the top. They will occasionally pause between bounces and fire three bullets in different directions before continuing. They are especially dangerous when they begin to bounce along the side of a mountain behind your ship. In the first stage, red Jumpers are actually more common than regular Jumpers. Rush units are not terrain units per se, as they fly through the air. But the are only generated from the hatches that can be found along the ground. You will never encounter them between stages like many of the other flying enemies. They rise out of the hatch until they are equal to or above your height, and begin darting forward to the left. Destroy them before they have a chance to collide with you. Amoebas are only found throughout Stage 6. They are flying enemies, but they don't fly continuously. Rather, they hover from one location to another, often pausing to regroup or change direction and chase after you. They are slow to attack, but they take a number of shots to destroy, so you have to focus your fire on one for quite some time before they will be destroyed. Don't get too distracted trying to kill one Amoeba. Always be aware of the Amoebas which might become bigger threats. Don't dash in for a power-up Capsule left by a red Amoeba unless the way to it is clear. 1000 points. There are three hatches that you will encounter throughout some of the stages. The Dagumu are present in Stage 1 and 4. The Gaomu are is present in Stage 2, and the Kanimu are present in Stage 6. They all behave the same way. 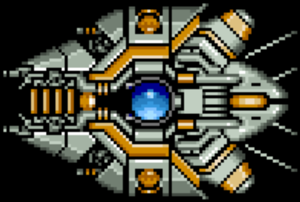 They are stationary, and open up from time to time, releasing enemies into the space above them. Once the enemies are released, they follow their own typical behavior. Hatches have a great deal of defense, and it take quite a lot of artillery to destroy them, but it's in your best interests to attack them in order to keep the overall number of enemies that you must face to a minimum. Hatches change color when they are about to be destroyed. 5000 points (arcade) or 10000 points (NES). (100 points [arcade] or 500 points [NES] for barriers. )The Big Core is the final stage boss for the first five (or six on the PC-Engine version) stages of the game. The strategy to defeat it will always be the same. The Big Core moves up or down, depending on your position after the last time it stood still. It will travel a certain distance before coming to rest again, and fire four beams from its guns. The beams are about the length of the Vic Viper, and spaced apart just enough for the Vic Viper to slip between them, but the margin of error is very small. The core in the middle of the ship is initially covered and the entire ship in invulnerable. As soon as the core becomes uncovered, the four barriers in front of the core become vulnerable to your attack. You must continuously fire your weapons at the barriers in order to destroy them, one by one, until the blue core is exposed. Then you can fire directly on the core until it take enough damage and the entire craft blows up. However, if you take too long breaking the barriers or destroying the core, the core will turn red, and the ship will become invulnerable again. After the core turns red, the ship will automatically self destruct after a period of time has passed. 2000 points (arcade) or 3000 points (NES). (100 points for energy rings.) The Moai of Gradius resemble the Moai of Easter Island a great deal, with one exception: These statues fire at you. 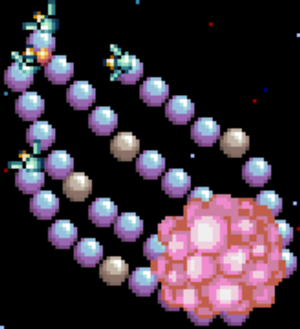 The Moai typically populate one particular stage in several of the Gradius games, and in the first game, they populate Stage 3. Moai have their mouths closed most of the time except when you end up in their field of vision. At that time, they open their mouths, and rings of energy come pouring out, flying your general direction. The rings are easy to destroy with a single shot from your weapons, but the number of them that appear can quickly overwhelm you. To destroy the Moai, you must concentrate a heavy amount of fire at the mouth of the statue when it is open and firing rings at you. Lasers give you a better chance for destruction, since the rings will generally stop your regular bullets. 1000 points (arcade) or 3000 points (NES). Mothers appear at the once at the beginning and several times at the end of Stage 3. A Mother is a large circular ship that advances to a point a certain distance away from the Vic Viper before briefly coming to rest. While it holds its position, it opens up and typically releases three Children at you, small indestructible disks that must be dodged. At higher levels, they can release more Children. Unlike the Children, the Mothers can be destroyed if enough fire is concentrated at them. If they are not destroyed after a certain period of time, they begin to advance again, drifting off the screen on their own accord. 1000 points (arcade). The Iron Maiden is a swift moving craft with no external offensive ability. Their only method of attack is collision. They appear at the very end of Stage 4, and start out by appearing in the upper right corner of the screen. They follow the terrain in a counter-clockwise direction, sliding down the left side of the screen, back to the right, and up the right side until they get even with your ship, at which point the advance forward at you. They appear one after another, and don't take a lot of firepower to destroy. It is best to attack them up at the very least as they drop down under the first volcano and back up to the land above it. If you're fast or powerful enough, you may be able to destroy it at that point. The very least, you'll weaken it up enough so that when it completes its journey around the screen, it will be much easier to destroy when it make a final advance on you. You must destroy a good number of them before the Big Core shows up. If you take too long to destroy them, they will ultimately surround you in the middle of the screen. Continue to fire at the lead Iron Maiden in an effort to destroy it before it reaches you. 1000 points (arcade) or 5000 points (NES). Tentacles are the sole occupant of Stage 5. The slowly float around through space. They consist of a pink fleshy core, surrounded by any number from zero to four tentacles. The tentacles all do their best to point at you and fire small bullets in your direction while the pink cores float aimlessly. Every tentacle has a weak point halfway between the claw and the core, and the entire tentacle can be destroyed by focusing relatively little firepower on the weak point. The core, however, is another matter. Cores are very strong and can withstand a lot of damage. As you attack them, they begin to shrivel, going through three different sizes before ultimately being destroyed. The cores are somewhat mindless, and can usually be avoided with little difficulty, but a core that still has tentacles can be quite a threat. Put the priority on shooting the tentacles, and only focus on the cores when there are no other remaining threats. Be aware that few more tentacles may trickle on to the screen when the Big Core arrives, but they usually usher themselves off quickly. This page was last edited on 10 April 2014, at 09:50.